Dogs Luv Us and We Luv Them: Don't BUY A Guinea Pig, Rabbit, or Hamster, RESCUE One! Don't BUY A Guinea Pig, Rabbit, or Hamster, RESCUE One! I'm taking a break from my usual content about dogs today to share some important animal rescue information. Most of us know that there are Rescue Organizations for nearly every breed of dog out there. What is less known is that there are also Small Animal rescue organizations for smaller animals you might be tempted to buy at a pet store or online. These are rescues for Guinea Pigs, Rabbits, Hamsters and other small animals. If your child is begging you for one of these furry little animals, please consider saving a tiny furry life by looking for a small animal rescue organization before you decide to purchase one! I hadn't known about the many small animal rescue organizations across the country until about 2 years ago. 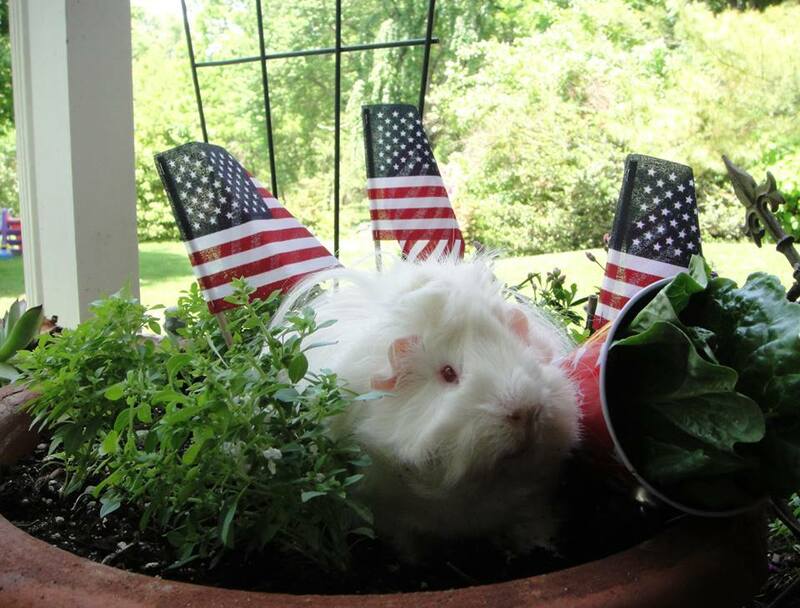 One such rescue organization is the METROPOLITAN GUINEA PIG RESCUE (MGPR), a non-profit organization that rescues, rehabilitates, and finds new homes for Guinea Pigs in the Washington DC, Maryland, and Virginia areas. MGPR also works to educate the public about the proper care of Guinea Pigs. 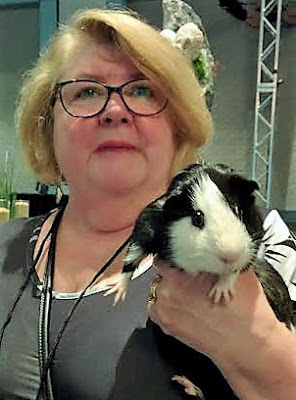 I met Becky Wilson, Medical Liason at MGPR, and her adorable foster Guinea Pig, Bobo at the BlogPaws Conference. I was really impressed with the work they do at Metropolitan Guinea Pig Rescue to rescue Guinea Pigs from local shelters, where they are often euthanized. Becky graciously agreed to an interview for Dogs Luv Us and We Luv Them to share with us all the wonderful work they're doing for Guinea Pigs in need, and why Guinea Pig rescue is so important. Becky with the adorable and charismatic Bobo at the BlogPaws Conference! Becky is currently fostering Bobo, who has some health issues. ME: BECKY, WHY IS THERE A NEED FOR GUINEA PIG RESCUE? Many shelters don't accept small animals like Guinea Pigs, and those that do often don't know how to properly care for them. Care of a Guinea Pig is very different from care of a dog, cat, or horse, which are the type of animals most animal shelters are trained to provide care for. One female Guinea Pig can potentially have as many as 30 babies in one year! They can also become pregnant immediately after giving birth. It's not easy to tell the gender of a Guinea Pig. Oftentimes people will buy two, thinking they are both the same gender, and end up with a litter of Guinea Pigs they can't find homes for! Their numbers can easily get out of control. Unwanted Guinea Pigs are often abandoned outdoors but are unable to survive on their own. "One day I went to a pet store and decided to purchase two rabbits. Next to the rabbits was a really cute guinea pig with long hair. I decided to buy her as well. I had looked first at local shelters and did not see any rabbits up for adoption. So that is why I went to the pet store. I came home with Reese, a long-haired guinea pig, and within two days, she had produced three babies! They were all so cute! My daughter at the time had a skating coach who wanted one guinea pig, so I let her adopt one, leaving me with mom 'Reeses' and her pups were 'Reese's Pieces'. This was in early 1994. In early 1995, I found out through an internet mailing list about a woman in Virginia Beach who rescued guinea pigs. She asked me if I would come down there and help her rescue 15 guinea pigs at the local shelter. So I drove down to Virginia Beach and we went to the shelter and picked up over 15 guinea pigs. I took home 15 of them.These guinea pigs all had very bad feet that we would later find out was a condition called bumble foot. I had them checked out by a veterinarian and then asked some of my own friends to adopt these guinea pigs and care for their feet. I kept four of them. At that time, veterinarians knew very little about guinea pigs and how to care for them. Not long after that I found out about a need to rescue more local guinea pigs that were abandoned at a local shelter. So I went over and got them as well. I decided to start a guinea pig rescue and called it 'Metropolitan Guinea Pig Rescue'. I did not take in any donations and all of the veterinary care as well as husbandry were out of my own pocket, and this included spaying and neutering them so they would not be bred. I did incorporate that year (1995) in the state of Virginia and proceeded to continue to rescue and rehabilitate guinea pigs and then adopt them out. People used to laugh at me and wonder why I was doing that and also why there would be a need to rescue guinea pigs. These sweet animals were being kept in the worst conditions because people had no idea how to care for them." Metropolitan Guinea Pig Rescue is run entirely by volunteers, currently 50 of them, and is mostly privately funded. We usually have about 50 Guinea Pigs in our care, all of which are in foster homes. We adopt out approximately 12 per month. Guinea Pigs are herd animals and are quite social. MGPR prefers to adopt out Guinea Pigs in pairs. 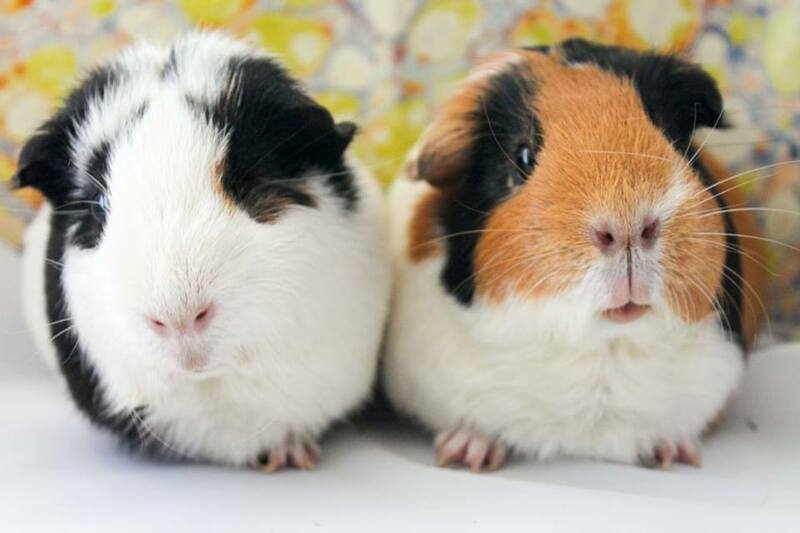 If you already have a Guinea Pig and would like a friend, we'll conduct Guinea Pig Speed Dating at our Adoption Meet-ups to help you find just the right companion for your Guinea Pig! We spay and neuter the Guinea Pigs in our care and provide medical care they may need. 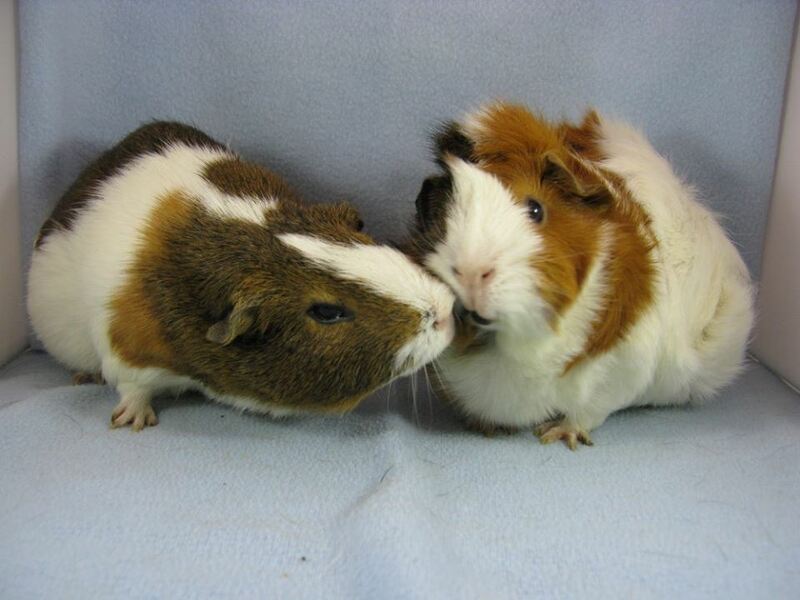 We perform a behavior assessment on our adoptable Guinea Pigs as well. MGPR does NOT take in individual owner surrenders. We rescue all our Guinea Pigs from animal shelters who are unable to adequately house and care for Guinea Pigs. The folks at MGPR are Guinea Pig experts. Educating people about how to properly care for Guinea Pigs is a big part of our mission. We often visit SPCAs to provide staff with Guinea Pig care and education! We also attend Animal Festivals, events like the BlogPaws Conference and Adoption Events to raise awareness and educate people about Guinea Pigs and Guinea Pig rescue. ME: WHY DO SO MANY PEOPLE SURRENDER THEIR PET GUINEA PIGS? Guinea Pigs are often bought on impulse, without much knowledge of how to properly care for them. This is especially true when a child sees them in the pet store and begs the parent to get one. I believe the required clean up and loss of interest are the main reasons people surrender their pet Guinea Pigs. Many people don't know that Guinea Pigs can be quite messy and require a lot of clean up and care. You need to clean their cages every day or two, and if their cage is too small it will always be dirty, and so will their tiny feet! Guinea Pigs actually need more care than dogs and cats in terms of clean up, as there is a lot of waste created by a Guinea Pig, and it's all in their cage. Once the Guinea Pig is home, kids often lose interest and don't like the smell and all the clean up, so the Guinea Pig gets left alone in their cage for many hours every day. Parents don't usually have the capacity to give a Guinea Pig the attention it needs and don't appreciate all the clean up either. ME: WHAT IMPORTANT FACTS CAN YOU SHARE WITH US ABOUT GUINEA PIGS? 💜Guinea Pigs are not good "starter pets" for younger children. Their hands aren't big enough to safely pick up and hold a Guinea Pig. They often drop them, which is not only unsafe for the animal but it makes kids not want to touch them again. They're best for older kids with larger hands. 💜The cages sold for Guinea Pigs in most pet stores aren't big enough! A proper Guinea Pig cage should be about 2.5 feet x 4.5 feet for two Guinea Pigs. No more than three Guinea Pigs should be in a single cage. A lot of urine and feces is generated by Guinea Pigs, they need enough room to get away from that. Cages should be cleaned every day or two at least. 💜Cedar chips, often sold as Guinea Pig bedding is bad for their lungs. They have their faces in it all the time and it can cause respiratory infections. Paper bedding is best. Aspen shavings are good too because they don't contain the oils that cedar has. 💜A child's bedroom is not a good place to keep a Guinea Pig. They need to be watched closely by the parents, as children may not notice an illness. 💜Veterinary care for Guinea Pigs requires someone experienced with exotics. Standard Veterinarians aren't usually equipped to handle the care and diagnoses of Guinea Pigs. Although generally healthy, Guinea Pigs should see a Veterinarian annually. Because they are considered prey animals in the wild, Guinea Pigs are very good at hiding their illnesses. If they appear sick or they stop eating, within 12 hours they can become very ill due to their rapid metabolism. They should be seen by a Veterinarian right away - don't wait! The House Rabbit Society, a National organization, can provide recommendations on Veterinarians that can treat Guinea Pigs. 💜Guinea Pigs will start losing weight if something is bothering them healthwise, so watch for weight loss. Ideally, weigh your Guinea Pig weekly, in grams. They should weigh on average 800-1400 grams, but can weigh as much as 1500-1700 grams. 💜You should never leave your Guinea Pig unattended outdoors, especially if Hawks are in the area. A Hawk will grab them and carry them off! ME: WHAT SHOULD GUINEA PIG OWNERS WITH DOGS AND CATS BE AWARE OF? Never leave a Guinea Pig alone with a dog, even if the Guinea Pig is in a cage. Their cage should always have a lid on it as well. If the dog shows too much interest in the Guinea Pig, or they want to play with it, be cautious. Larger dogs in particular can be an issue. I only know of one case where a dog has killed a Guinea Pig. It was a long haired Guinea Pig, and when the foster mom brought him home the dog apparently thought it was a toy. Probably because the long haired Guinea Pig looked different than any other she had brought home before. Cats actually like Guinea Pigs! You'll often find cats inside the Guinea Pig's cage, curled up and happy together! Many people have cats and Guinea Pigs with no problems. However, baby Guinea Pigs could be considered prey by a cat, so be aware of that. You know your own cats and dogs so be aware and judge their reactions. Know your animal and be honest with yourself about the attributes of your pet. ME: HOW CAN THE SURRENDER OF GUINEA PIGS BEST BE CURTAILED? Education! Do your research on the habits and care of Guinea Pigs, be prepared for the cleaning needs. We would like pet stores to stop selling Guinea Pigs, just as many of them have stopped selling bunnies. Getting them out of the large chain pet stores will curtail begging children and the impulse buying goes along with it. We'd like to see more people ADOPT, not SHOP. Just like puppy mills, Guinea Pig breeders tend to keep their Guinea Pigs in horrible conditions. More adoption and less buying at pet stores will help curtail the number of Guinea Pigs that are surrendered to shelters and in danger of being euthanized. THANK YOU BECKY FOR TAKING THE TIME TO TALK WITH DOGS LUV US AND WE LUV THEM ABOUT METROPOLITAN GUINEA PIG RESCUE!! KEEP UP THE GREAT WORK SAVING LIVES! If you live in or close to the Virginia/Maryland/DC area and are interested in fostering Guinea Pigs, please access the MGPR Foster Application Form on their site. If you wish to make a donation to MGPR, they gratefully accept monetary donations. They will also benefit from Guinea Pig food donations, but they are very discriminating about what they feed the Guinea Pigs in their care. They only feed them Oxbow brand food, as they don't feel many other commercial foods for Guinea Pigs provide optimal health. They co not accept cages because they don't feel the average cage size in pet stores, which is what most owners have, is adequate for optimum health and happiness of Guinea Pigs. VISIT THE METROPOLITAN GUINEA PIG RESCUE WEB SITE TO LEARN MORE ABOUT GUINEA PIGS AND MEET ADORABLE GUINEA PIGS AVAILABLE FOR ADOPTION! FOLLOW THEM ON FACEBOOK ! Have you ever adopted a small animal from a rescue or shelter? If not, would you consider doing so? Please share your thoughts in the comments, we value your feedback!! Thanks guys, I'm glad you liked it. Kudos to Mom for looking at Guinea Pigs at a shelter and not the pet store! I don't think we have a guinea pig or hamster rescue around here although we do have a rabbit rescue. It's a great idea! If there's one in a neighboring state and you're willing to travel a little that can help. Some rescues are happy to travel to make an adoption, & have transport volunteers available. Teachers should also be educated. Many elementary school teachers keep.small pets in cages to teach kids "responsibility". In most cases,the cage is too small and even the teacher doesn't learn proper care. Oh you're so right about that! Teachers should be properly educated about a pet before bringing one into a classroom. I think cages sold in pet stores in general are often too small. This is great information, thank you! I had hamsters when I was a child, and my brother had pet mice. But I don't know anything about these little piggies...and glad that today, there are exotic vets able to help them stay healthy. Thanks Amy, I'm glad you enjoyed it! I had a hamster too as a child, I named him "Ham" - real creative, right LOL! I'm so glad there are both exotic Vets and rescues available for Guinea Pigs. Great info! I am always surprised at how many small animals are surrendered to shelters. Thanks Beth. I'm surprised too, it's terrible isn't it? But I'm really glad there are rescues like MGPR to help. Absolutely fabulous post. I am a cat person, but all animals deserve loving homes! Oh, thank you Kristen, I really appreciate that! I agree, all animals deserve a loving home and there should be rescues for any animal in need. So interesting! My friend had a guinea pig when we were kids and I enjoyed spending time with her. This is really helpful information for someone thinking about adopting a small pet. My brother and I had one too as kids, I really loved that little piggie! I honestly don't recall what happened to him... I do hope my post helps others who are considering getting a Guinea Pig. Our local humane society takes in small pets. They seem pretty well taken care of but they're a large place and they take in a lot of different animals including horses. That's so wonderful! I'm so glad the Humane Society near you can take in small animals and so many others! I didn't have the opportunity to meet Becky at BlogPaws, but now I do. What a wonderful rescue! I'm sharing this post on Twitter. Thanks for sharing the post! I know they really want to spread the word about caring for guinea pigs and about their rescue. I loved meeting Becky and Bobo at the conference. So important! I think people forget that there are actually rescues for animals like guinea pigs and hamsters. Oh definitely, and many people don't even know they exist! That's the main reason I did this post, to share with folks how easy it is to rescue a small animal vs. buying one at a pet store. Oh my goodness, I had a Guinea pig growing up and remember the amount of clean up but I also remember how much I loved him/her (we never knew the gender). I totally agree they are not good started pets for young children. In my early years I got in trouble on several occasions for having forgot to clean the cage. Thank goodness the little furry one loved me anyway and my parents were on it! Thank you for such great information and to the Metropolitan Guinea Pigs Rescue! I had one too and I love it! I don't recall the cleanup, probably my poor mom had to do it. I don't think they're good starter pets for small children either. What a great interview! I talked with Becky for a bit at BlogPaws too, wonderful woman. Such cute pocket pets. Thanks so much Tonya! I was really happy to talk with Becky about their rescue, they do such great work. I love this idea. And I second the notion that teachers need to be made aware of this. I agree, teachers should be aware of the cleanup and care involved in having a guinea pig in a classroom. I hadn't thought about it until someone mentioned it in the comments. I don't think guinea pigs are the best classroom pet. Well said Ruth! I don't think a guinea pig is the best pet for a classroom, I'd start with something smaller and definitely a rescue. Awesome post! I'm not sure if we have a small animal rescue around here or not. I will have to check and see. The kiddo was mentioning wanting a hamster a while back. I'm not sure if we will get one or not, but I'll keep this in mind. Thank you Kia! If you do get a hamster please search for Hamster Rescue, Small Animal Rescue, or check with your local shelter. I bet you'll find one. I didn't even know they existed until about 2 years ago. I had no idea that cats and guinea pigs would get along. I've never been around guinea pigs too much, so I would have no idea about their care. Great post. Isn't that something!? I was so surprised to hear that, I almost didn't believe it! I wonder if Truffle and Brulee would like a little piggie brother or sister?? LOL! This is really interesting! I have heard of a few guinea pigs and hamsters being available for rescue recently. Personally, I have to agree that rescuing any pet is a better option than purchasing them from a store. Rescues do a much better job of creating value for each life. When someone gets a pet from a rescue, it doesn't seem to be perceived as a "purchase" like it does in a store. I agree, rescue is the way to go whenever possible. Thank you very much for this article! I have no knowledge of care for Guinea Pigs and learned a lot by reading this post. Every once in a while Adopt-A-Pet will showcase a rabbit or guinea pig up for adoption, but I don't see much about adoption/rescue for them. Thanks again for putting the awareness out there! Thanks Karen! I wanted to get the word out that there are guinea pig rescues and other small animal rescues out there. People can look for a rescue in their area rather than buying a small animal. I am glad that small pets are available for adoption! I just saw some adoptable rabbits at my local PetSmart. I'm glad there are too! I hope the rabbits you saw at PetSmart were for adoption not sale. I thought they stopped selling rabbits! There are so many rabbit rescues out there, not need to buy one. What great info! Guiniea Pigs are so so cute, and tender, I can see how a rescue would benefit these little guys! The folks at MGPR do such a great job with the guinea pigs in their care, I'm so impressed by them! I have never heard of a guinea pig rescue, but agreed I think there should be a rescue for all types of pets! So many people never heard of guinea pig rescue, or small animal rescue in general. I think there should be rescues for all pets too! I absolutely loved my last guinea pig Lulu, but I think she came from a pet store about 15 years ago. She was originally for my girls but they lost interest. She was so noisy and sociable, she loved being with me and ran around my office which I had to proof. She had a big cage but it got pretty messy/smelly fast. This is such important info- I will have to share on Kids' Pet Club as many kids and parents are not aware of the work or the adoption option. Aww, I love that name Lulu, and she sounds so precocious and spunky! I bet she was adorable. I'm so glad you're going to share this on your Kids' Pet Club site, thank you! It really is important information to have before diving into getting a guinea pig! I'm happy to share this info and the fact that you can rescue these cute little guys. When Should Your Pet See The Veterinarian?